Range rider Bree and her horse Shasta out for a morning's ride. Photo by Hilary Anderson. This month riders spent approximately 250 hours in the field and covered a minimum of fourteen sections monitoring six herds of cattle. In addition, riders also spent time tracking wolves, bears, and elk throughout the larger Basin, setting trail cameras and assisting ranchers with two depredation events. Over the month of August, riders will be concentrating their time on Forest Service Allotments with thick ground cover and rough terrain. Riders are observing that these conditions make it difficult for cattle to stay together, and the compromised footing makes cattle more vulnerable to predation. Because of these factors, high human presence in the area is required in order for riders to be effective at monitoring cattle. The calf skull from a probable grizzly depredation in July. Photo by Melissa DiNino. Riders found one calf that was confirmed as a "probable" depredation by a grizzly bear. This confirmation by Wildlife Services was supported by the riders' knowledge of the herd health and overall presence among this herd. The remains of this carcass were found in very thick ground cover but were not far from a human residence. A second depredation event occurred when fourteen goats were attacked, and some killed, by a single adult wolf. This depredation event occurred in late morning while the goat herd (1,000 goats) was grazing near some thick ground cover and was witnessed by some of the ranch staff as well as the goat herder. In response, riders assisted in setting up electrified fladry and fox lights around the goat night pen, monitored the area through field cameras, and were able to identify the individual wolf responsible. The following day the goats were moved out of the Basin to eliminate the potential for further conflict. Grizzly bear activity continues to increase and riders are reporting an average of two bear sightings or encounters per ride. Grizzly bear encounters with cattle or overall presence around cattle (less than 400 yards from cattle) is very high but depredation events remained low this month, which is not uncharacteristic for this time of year. Each ranch has reported observing seven or eight bears on their respective properties, which we anticipate to be a minimum summary of grizzly bear activity across these ranches. Wolves are moving farther from their den area this time of year and have been traveling as much as five straight-line miles from their den site. The pups are old enough to be moving around the landscape now, although still with adult wolves. The pack relocated to their historical rendezvous site near the end of July, as has been the case in past years as well. Due to the availability of many small prey animals on the landscape this time of year, wolves often travel alone or in very small groups (as opposed to traveling together as a large pack unit), therefore, although these wolves have a very high encounter rate with cattle due to the nature of their territory amidst high livestock use areas, we have seen relatively low depredation by wolves on cattle so far this season. Looking over cattle as the sun rises in the Basin. Photo by Hilary Anderson. This month cattle started moving into higher country and onto a few Forest Service Permits, making for some longer rides. Range riders are continuing to monitor six herds of cattle and track wildlife primarily in areas used by livestock. Riders have observed that in herds NOT contained by electric fence, cow/calf pairs are naturally keeping themselves in multiple small groups and responding to potential threats very quickly and seemingly effectively (cows quickly mother up with their calves). Riders have also observed that in pastures with rugged terrain and thick ground cover, cattle tend to scatter more with only a few individuals near each other at any given time. These cattle also tend to flee when threatened. Riders are making an effort to document different cattle behavior in response to a predation threat and will continue to do so throughout the season. A single cow elk travels just below the cattle pasture at sunset. Photo by Melissa DiNino. Riders have found 3 elk calf kills and 1 adult elk kill in areas also used by livestock. No livestock have died (that riders know of) this month and no carcasses of domestic animals or wildlife have been removed. By mid June, riders noted that elk were coming back together in small herds (8-14 adults) and observed 2017 calves in the herds on two occasions. There have been some elk either co-mingled with cattle or less than 400 yards from cattle on a daily basis. Wolf presence during the month of June, through observations and tracks, has been lower this year than it has been in the past five years. However based on GPS and VHF data from the collared wolves in this pack, it appears that wolves are frequently traveling through and around the Basin and often moving through pastures being used by cattle. Therefore, we are concluding that the wolves are still using the Basin similar to how they have in the past, but they are becoming more wary of humans (thus having less encounters with humans). Documentation of wolves by riders on trail cameras is high and supports the thought that wolves are still actively using the Basin despite fewer visual observations. Near the end of June, grizzly bear activity began to increase after a fairly slow, but characteristic early June. One sow with two cubs of the year has been documented. 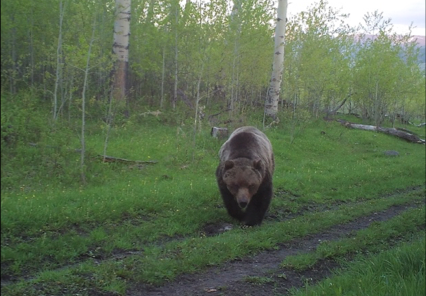 In addition, the sow responsible for a depredation on a two-year-old steer last year has been seen out and about with three cubs of the year. This bear is still wearing the GPS collar that was put on her in 2016. Several individual bears have been observed and tracked, as well. A single adult grizzly has been documented foraging in a pasture and near a herd of cow/calf pairs. Both the bear and the cattle appeared unbothered by each other over the course of multiple days. Tom Miner Basin Association's (TMBA) range riding season began in early May this year. Riders began the season tracking and scouting new areas as well as documenting wildlife with a focus on predator sign. Cattle have been returning to the Basin throughout the month and our riders began riding on a daily basis during the last week of May. As in past years, riders are out at first and last light in an effort to increase human presence around cattle, communicate accurate information about cattle back to ranchers, and find carcasses in a timely manner. In some cases riders are also working to keep cattle loosely gathered in a herd, thus making them (especially calves) less vulnerable to predation. The Basin has had one wolf depredation on a calf during the month of May. Riders discovered the carcass during their evening ride and removed it from the pasture. The calf was approximately 1.5 months old and in good health. Riders met with Wildlife Services the following morning and through their close examination of the scene were able to confirm the kill. Based on the level of feeding on the calf, it is believed that a single wolf was responsible for the kill. After the investigation, the carcass was completely removed from the area and placed in a cattle-free area of the Basin. Early in May, riders began tracking wolves, bears and elk. Based on locations that riders are able to access, elk were highly concentrated in areas of the Anderson Ranch, the Hubbard Ranch and Grizzly Creek Ranch. Two elk were discovered in separate areas of the Basin that had been killed by wolves. This month, riders also confirmed that the wolf pack, known as the Steamboat pack, has pups of the year. 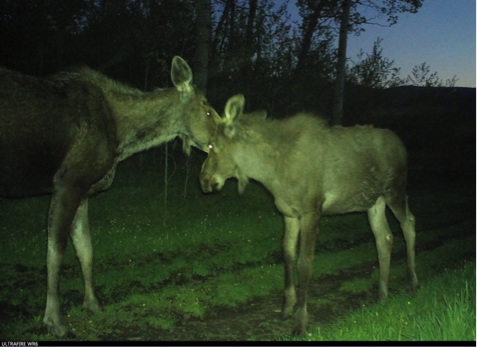 Later in May while monitoring cattle, riders spent time tracking wildlife (primarily wolves, bears, elk and moose) through ground tracking, field cameras and visual observation.